This is an In Person signed Colour 10" x 8" photo of the Jamaican reggae artist. 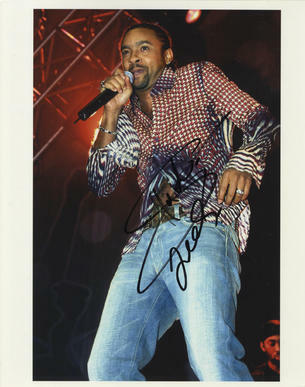 Orville Richard Burrell (born October 22, 1968), better known by his stage name Shaggy, is a Jamaican-American Grammy Award-winning reggae singer and rapper. He is perhaps best known for his 1995 single "Boombastic" and 2000 single "It Wasn't Me". He has been noted as having a baritone-range singing voice, and he is easily identifiable by his signature slurred rapping and vocal style. He is said to have taken his nickname from his shaggy hair.